You might think the humble herb doesn’t have a lot of star power. Let Caitlin Atkinson convince you otherwise. 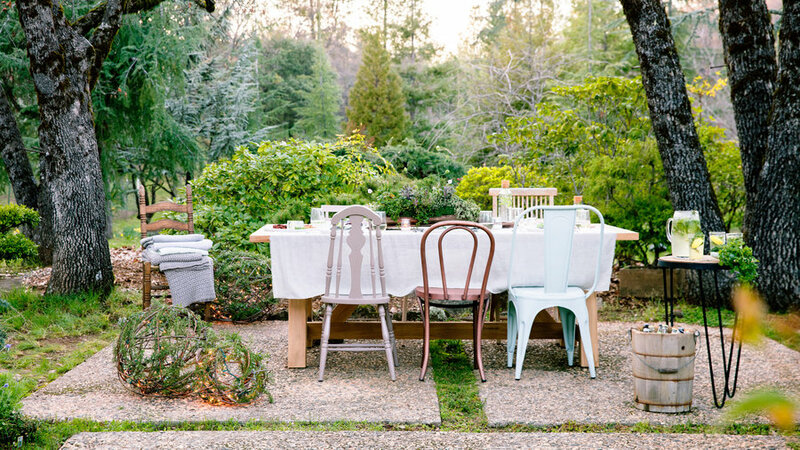 The photographer and stylist literally wrote the book on crafting with plants (Plant Craft, out from Timber Press in fall 2016), so when her family gathers for dinner in her grandmother’s garden in Nevada City, California, Atkinson is almost always on decorating duty. 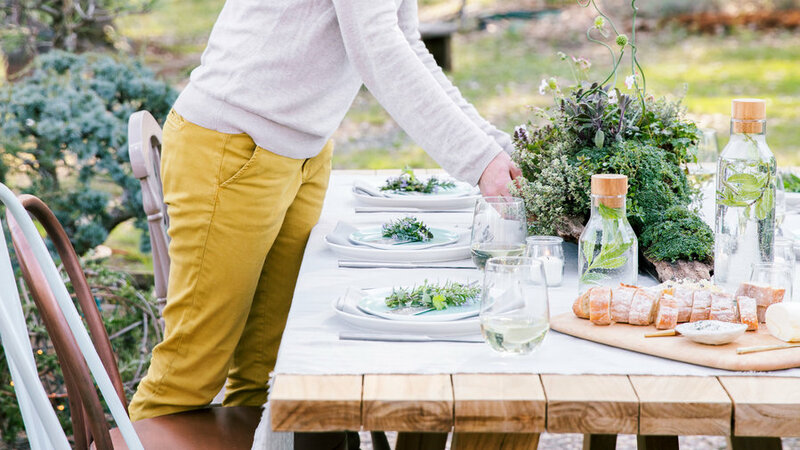 Lately, thyme, rosemary, and other culinary standbys are finding their way onto her table as easy flourishes and softly scented centerpieces. “Herbs are a fresh alternative to flowers, and they’re all around us in the summer,” Atkinson says. “This is a garden party; it’s supposed to be relaxed,” says Atkinson. She suggests letting the greenery provide most of the decoration and keeping the look loose. She pulled indoor chairs around her patio table for a mismatched look. for Renais beam table. for Redsmith and Brasserie dining chairs. Wooden chairs, vintage. 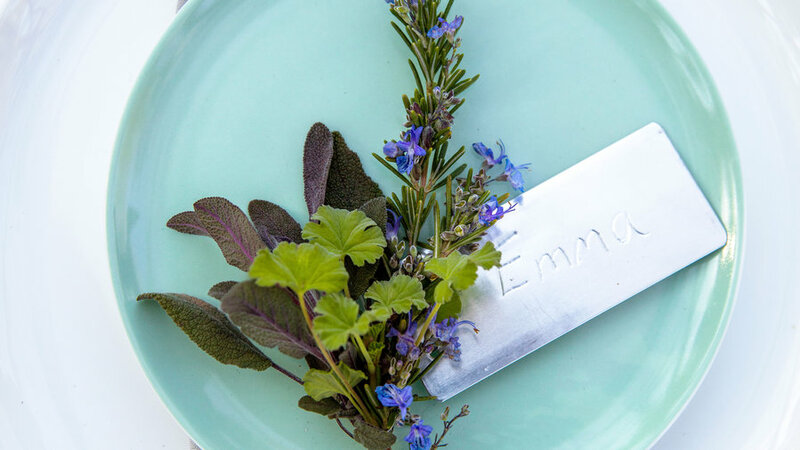 Etch each guest's name on a metal plant tag with a pen tip, then wind the tag’s wire around a cluster of rosemary, purple sage, and scented geranium leaves. for Belay celery green salad plates. Atkinson created a centerpiece with an eye toward planting the herbs after dinner. 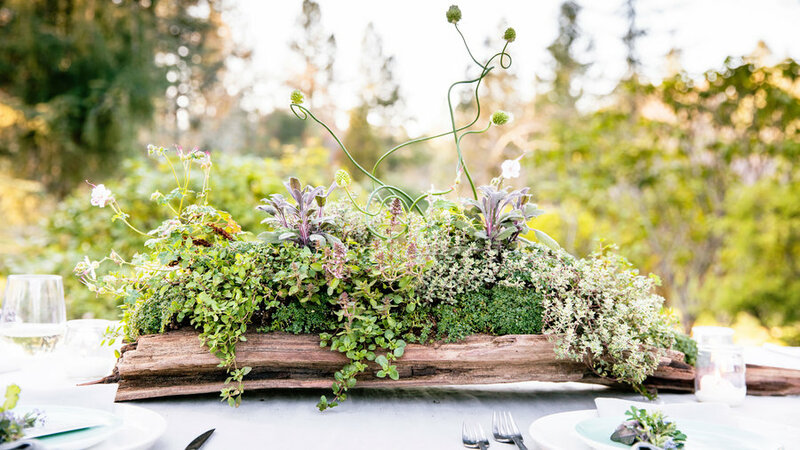 To make it, she chose three types of thyme, scented geranium, and allium plants for height; removed them from their 4-inch containers; and placed them directly onto a relatively flat piece of cured driftwood. A little soil and ‘Elfin’ thyme tucked around the edges hide the roots. 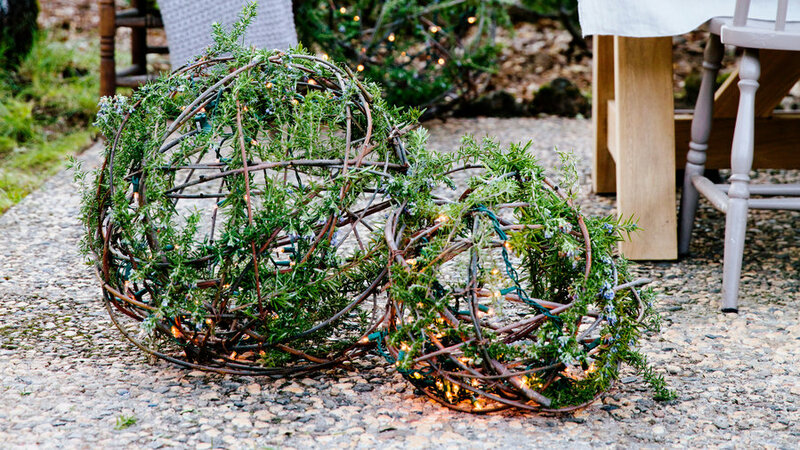 As the sun sets, keep guests at the table with a warm blanket and willow spheres filled with battery-operated string lights. Weave in rosemary cuttings and secure with twine. for throws. 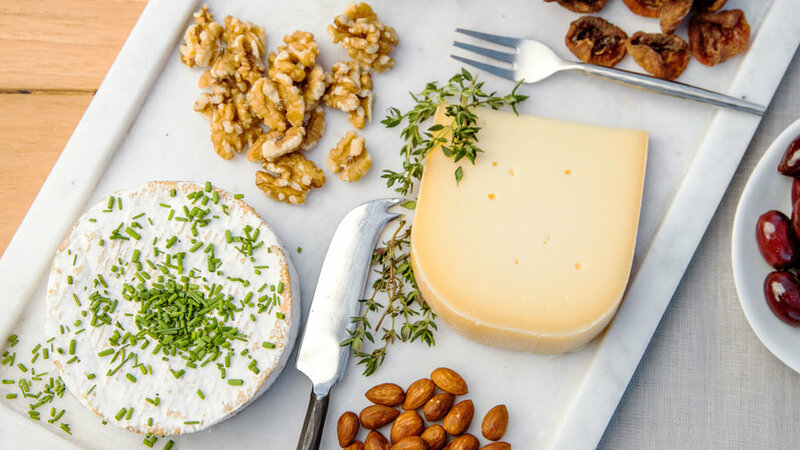 Dress up camembert with a dusting of chives, toma with thyme, and blue cheese with a sprig of dill. The herbs complement the cheese and add color. 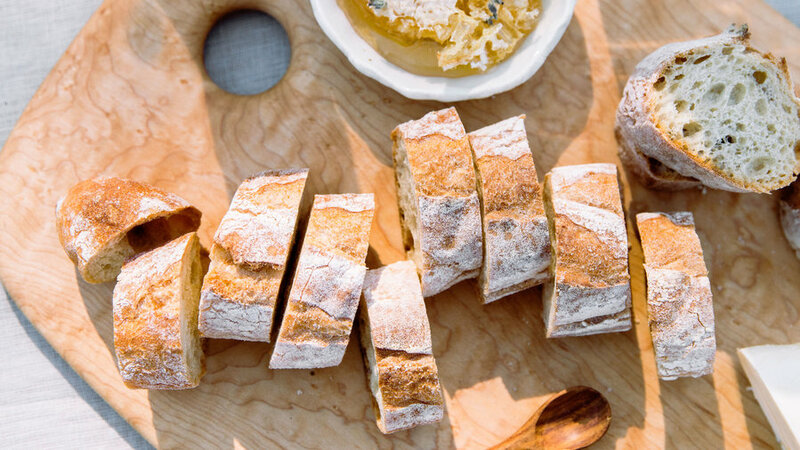 A basic baguette gets an upgrade from honeycomb topped with lavender and a sprinkle of herbed salt—kosher salt mixed with minced garlic, sage, and rosemary to taste. 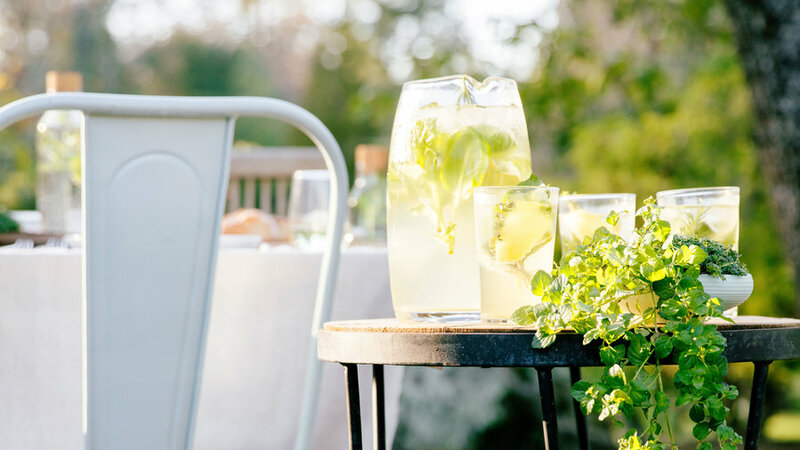 As refreshing as lemonade but more nuanced, this spritzer includes an infusion of four herbs. 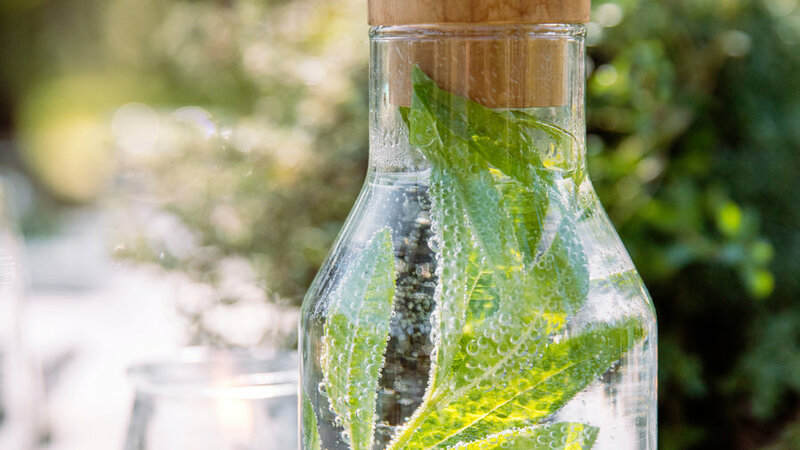 A stem of lemon verbena refreshes a carafe of sparkling water.